World events like the civil war in Syria, the financial crisis in Europe and the political deadlock in Australia and the United States make evident the need for symbols of trust and reconciliation. Gestures such as the National Apology to the Stolen Generations in Australia and truth and reconciliation commissions in South Africa have made possible a new approach to old division, even if those possibilities have often been squandered. Religions have traditionally been good at offering symbols of trust and reconciliation. Confessional rites abound in the Christian churches and there are many formal greetings that speak of reconciliation. Churches have had a small role in brokering national and international disputes. For that reason it is a pity that so many recent stories of the Catholic Church have spoken of mistrust rather than of trust, of dividing rather than of reconciling. So it is a pleasure to reflect on the consecration of the new Bishop of Toowoomba, Robert McGuckin. The details of this celebration spoke creatively of trust and opened possibilities of reconciliation. In prospect the consecration of the new Bishop must have seemed to demand skills like those required when negotiating entry to a harbour surrounded by dangerous shoals and currents. 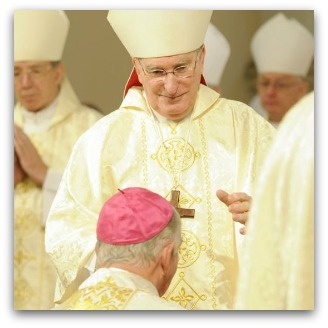 His predecessor, Bishop Bill Morris, was very popular in the diocese. But he had been removed from his position in an unsatisfactory process that caused widespread disquiet. The consecration could easily have been seen as an assembly of complicit men imposing their will on a resistant people. That would have made it more difficult for the incoming bishop to gain and build trust among his people. In the event the ceremony allowed a space for trust and for reconciliation. Morris was present at the ceremony. He handed the crozier, the symbol of the bishop's office, to McGuckin and accompanied him to the bishop's chair. In his remarks at the end of the ceremony, McGuckin praised Morris and thanked him for his help and his service to the diocese. His words of appreciation were met by the congregation with sustained applause. All this sounds gracious and natural. But it required a high level of trust, given that the consecration was the culmination of a series of events that had been marked by mistrust. Morris and McGuckin both showed considerable magnanimity. The congregation responded with equal magnanimity, the seedbed for mutual trust. The symbolism of the ceremony had broader implications. It revealed the importance of the distinction between moving on and letting go. After faits accomplis such as the invasion of Iraq and the dismissal of Morris, the voices of pragmatism are always heard advising us to move on. The deed is done: it should now be forgotten and we should get on with life. This is the logic of power and submission. When power has been exercised we should submit, applaud and avert our eyes from the casualties. This is what moving on means. The symbolism of the Toowoomba ceremonies was not about moving on. In applauding Morris so long and loudly, the people expressed their esteem for a man who was deeply trusted. But they also expressed their judgment on what had been done to him. They were given the opportunity both to remember what they saw as an injustice and at the same time to let go of anger, paralysis and alienation. It was a statement that the faith that bound them together as fellow human beings and Catholics transcended the injustices, angers and compromises that divided them. Letting go expresses the logic of love and trust. It leads people to remember what has been done badly and the people hurt by it. But it also leads them to engage with others in a new order, even if this has come about through bad behaviour. The ceremony itself took place on the feast of St Benedict, which was not without its own ironies. But the monastic Rule which bears Benedict's name is full of symbolic gestures of trust. The Rule commends obedience. This is often presented in terms of power and submission. But for Benedict's Rule obedience is about listening to Christ. It begins and ends in love. Because Christ is found in others, obedience is about mutual trust between monks and abbott. Perfect love sidelines irony. The consecration of Bishop McGuckin was a domestic event in a country church. But it threw into relief the poverty of our public life and the desperate need of symbols of trust such as those seen in Toowoomba. Great article Andrew. There is trust in the new regime at the moment here but I am not sure Rome will be trusted again in our lifetime. Thank you Andrew for your insightful, wise reflection on the ordination of the new bishop in Toowoomba. Bill was my bishop for fifteen years and like most people in the diocese I held him in the highest regard and with real affection. I know nothing of the new bishop but the symbolic gestures you describe so well are typical of Bill's humility and graciousness - a man without bitterness, a real living saint of the church. I hope the new bishop carries the mantle passed on to him with the same spirit of humble, compassionate service. Catholic Institutional orthodoxy repeatedly dictates to the "the faithful" that anger breeds paralysis - self-serving propaganda which conveniently benefits a pattern of abusive power begetting submission. The "removal" of Bishop Morris was unjust, and a means for the Catholic hierarchy to continue on, business as usual, a thorn in their poorly developed collective conscience dismissed. Symbols and prayers mean nothing to those wounded by the institutional church - on the contrary, they are empty, galling, patronising and add insult to injury. Fine words form the white washed walls of the tombs which contain dead mens' bones. Nice try, Andrew, but it's like saying that the excommunication of Mary MacKillop called for reconciliation rather than the acknowledgment of a great injustice. Real, rather than superficial reconciliation, requires honest admission of injusice. Fr John, I'm just wondering if there's been an honest admission of injustice by the Romans Empires and the Jews for the persecution death of Jesus - the details of some injustices will just never be fully articulated, but eventually we believe that hope and history will rhyme. It is so refreshing to read in ES an article that speaks of the Christian (Catholic)practice of reconciliation and forgiveness which it seems has happened in Toowoomba. Not even Bishop Morris or his parishioners appear to have "maintained the rage", unlike some of the correspondents above who might well benefit from learning to forgive as Christ does. Perhaps, then they might have something to offer the world. ES might also care to consider whether the constant criticism of the Church, the Pope, the Cardinal and all things Catholic that it publishes are in the realm of reconciliation and forgiveness, or simply outlets for those who cannot find forgiveness. Yes but those to whom the deed is done, soon paled into oblivion.. that's what "moving on means". It's the worst new age synonym used. Bishop Morris had no other choice, he was spiritually coerced. So too many others, struggling to face another day. No wonder there are so many Catholics keeping psychologists and psychiatrist's in business. Irenic, as usual. Thank you Andrew. No, L.NEWINGTON, "moving on" means - pretend that you are not hurt by the situation so that I may live guilt and burden free, to carry on my happy life/career/vocation. Thank you for this article, Andrew. It is interesting to note the prolonged and loud applause afforded Bishop Morris at his successor's Episcopal Ordination. I trust the Nuncio was listening and reports back to his superiors. In addition, there was also applause at the mention of Bishop Bill's name at last Sunday's Mass, when our Parish Priest gave a brief report on the ceremony. I have never before witnessed anything like this in a long lifetime of Mass attendance. Like you, I interpreted this Parish applause not only as an expression of love and admiration for our previous Bishop, but also as a statement of how the people feel about the actions of Rome in having him removed from office. My prayer is thet Bishop McGickin will be an agent for healing in a diocese still smarting from a grave injustice. An extremely sensitive and insightful article, thank you, Andrew. I think the two bishops involved certainly seem to have risen above the detritus which is wonderful and that prognosticates well for the future. In the world of counselling the awkward and difficult issue of anger is often forthcoming. It's not unusual for the counsellor to advise a client that they must try to get beyond their anger because it can stifle and fixate the ongoing processes of wholesome living and human interaction. Often that anger is embedded in a powerful sense of being wronged, of being dealt with in an unjust manner, of one's dignity and rights being flayed by questionable forces of control and diminution. It is almost impossible to placate an anger that needs to live as a proclamation of some dictatorial reality. Will anyone ever say 'sorry' to the people of Toowoomba? Bishop Morris showed true humility and grace thus allowing his former flock to move towards healing. And in the process he moves closer to healing. A glimmer of light for a besieged church. That one has to pretend: a game that seems to me for children, and insulting that a grown human being is coerced into playing. So all that remains as the dust settles is to clip the wings of the Temple Police who were the instigators of the initial reports. Alas I neither see nor hear a communication originating from Rome. Thank you Andrew for telling us this wonderful story of reconciliation. Thank you also for being such a strong, fearless voice for justice in this whole sad saga. I can't see why "clipping the wings of the Temple Police" is relevant. It's the Pope who has the final say in all this, and it's the issue of the day that matters, not the gossip and bullying tactics. It's interesting how people blame their fellow pew-sitters when it suits them. Thank you Andrew for your sincere and insightful article. I value the touch of humour in 'the voices of pragmatism' come forth to aid the ultimate Moving On. May the equally sincere applause for Bishop Morris also continue. From Archbishop Coleridge's stirring homily: "The call of Christ, echoed by St Benedict, is crucial for all believers, but especially for Bishops. The Bishop’s first task is to listen to the voice of the Lord and to put into practice what he hears, to obey the commands of Jesus, whatever the cost of that surrender. Only then will he be truly equipped for the ministry which the Lord mercifully entrusts to him. Only then will he bear what Jesus calls “fruit that will last”. If a Bishop fails to listen to the words of the Master, he will prove to be a law unto himself, every bit as bad as the wandering monks, or worse since he is the shepherd of the flock. For St Benedict, to remain in Christ’s love means to remain in the community where that love takes flesh, that is the Church. Jesus says, “Remain in my love”, and he means “Remain in my Church”. The love is all his, and so too is the Church. The Church belongs to Jesus, not to the Bishop. If we seek Jesus apart from the community of the Church, we end up with a Jesus who looks and sounds just like us. We end up like the wandering monks who are a law unto themselves, abandoning the way of obedience and love, searching for life where only death can be found. That’s why the deep and at times demanding communion of the Church mattered so much to St Benedict in his time, and why it matters no less to the Diocese of Toowoomba and its new Bishop at this time." Yes, HH, and as we are currently witnessing, sometimes protecting the communion of the church means overlooking scandalous abuses cases and applying damage control mechanisms like moving offending priests to another location. Paul Goodland: excellent post. I think Bill Morris really sorted out the paedophilia situation in Toowoomba in the way a real bishop should and his memory will live in the hearts of the people there. Bishop McGuckin and Archbishop Coleridge will be judged against their saintly and illustrious predecessors. Archbishop Bathersby really handled paedophilia the way it should be handled. I think the people of Toowoomba and Brisbane are waiting to see if their, seemingly more Vatican approved, successors measure up as Christlike pastors. John Frawley, there is no peace without justice. Justice was not done. Therefore peace cannot ensue. Michelle Goldsmith is merely speaking the truth. I did not attend nor watch the live web streaming of the ordination ceremony. But I heard from someone who attended, that the word "obedience" was used perhaps 25 times during it. And it was also crystal clear why there was sustained applause for Bishop Morris. I suspect that is not how people attending would have interpreted it, but rather, in the other sense Andrew notes <<in terms of power and submission>>. Certainly that is how my informant interpreted it. The new bishop has made a good start at reconciliation in asking Bishop Bill Morris to participate in the ceremony, but the odour of Rome will be difficult to overcome. The sustained applause was the people letting all the other attending clergy know that. Does anyone else get a bit jaded and disheartened that the rituals, the law and the traditions are outweighing the original intention of the spiritual/social movement Jesus started over 2000 years ago? If an alien spaceship landed here today and observed what's going on in the Catholic Church, do you think the aliens would feel the vibes of what it's all about? Aurelius Alien green men are hardly credible exegetes of Sacred Scripture. Remember Jesus created a hierarchical Church of all male apostolic bishops at a highly ritualised Jewish meal with injunction "Do this in memory of me"[including ordination] Jesus gave Peter and successors the authority to acculturate his teaching in fidelity to his teaching [eg in liturgy and canon law]-"whatever you loose on earth etc"
I find that we the people that sit in the church pews are treated like children. We cannot question Rome at all. The Catholic Leader will not publish anything that questions Rome. The majority of the Catholics in Toowoomba supported Bishop Bill and still do but no Rome has taken the big stick out and say they know best for us. Time is coming as we the common people and I am sure a lot of Priests will stand up to Rome and say enough is enough we want our say. Freedom of speech in all Catholic media must be allowed. What a beautiful photo of Bishop Bill. He showed real courage to be on the altar that day with his fellow Bishops. What hurt was he feeling sitting among them and listening to that sermon. Toowoomba Catholics and members of other Churches still embrace him. Our new Bishop is a good man too. What a great jesture he showed to Bishop Bill. I pray that his ministry will be a blessing for us. I do believe that anger, parlaysis and alienation remain for the people of Toowoomba,in spite of what might cynically be seen as an "appease the masses" gesture of involving Bill in the ceremony. This is not to diminish Bill's graciousness in being involved...a painful time for him, but his gesture of support for the baptised of his local Church and perhaps a faithful and forgiving effort at episcopal unity. But, were the bishops, so obvious at the ceremony, obvious in their support for Bill at the critical time? Why is there no official movement for inquiry into the injustice done to Bill and the people of the Diocese? Do articles such as Andrew's become complicit in the cover up? Does forgiveness and attempting to dialogue mean that we have to ignore a wrong and pretend that silencing, control and exploitation of the people of the Church is not a serious ongoing problem. The work of the local liturgists and clergy for the ceremony was wonderful.However,if the consecration of Bishop McGuckin was indeed a "domestic event in a country church", it was also an event of powerbroker's whitewash..a well controlled orchestration by the Coleridge/Fisher version of church. We must not overlook that Bishop Morris is in trouble because he openly talked about the problems he foresaw in trying to meet the needs of his flock. Surely any worthwhile realistic Catholic must despair when we see the burden being borne by our rapidly depleting number of mostly aged Priests. Meanwhile our Bishops' solution is to close more churches-but dare not suggest practical solutions. I just wish HH would let us know who he/she was, and not hide behind the Archbishops words! I disagree on his assessment of the homily! Thanks, Fr Vince. I myself am much more interested in ideas and arguments than in the identity of those who put them forward. But for the record, I heartily support some of your posts in the past, while am so-so about others. I have reasons for preserving a modicum of anonymity, and in these days of identity theft, etc, would caution others to think along the same lines. In a decade or so I think our current blase attitude of bold "transparency" and "openness" will be reckoned as utter naievity. Indeed the ever- accumulating sad testimonies of many current victims of web-sourced attacks, from so many angles, is already alerting internet users to the importance of securing privacy. It's a sad comment on these times, but I would caution all web users, including lowly blog respondents, to consider well these issues before revealing personal data of any specificity. Bottom line: Google on this topic before taking the plunge. Cheers. Both we and the Church need ongoing renewal. I suggest readers go to the 'Catholics for Renewal' website, click on the 'News' section, and read the inspiring 'Translated final interview with Martini'. Before he died, Cardinal Martini reportedly said, among other things, 'Where are the individuals full of generosity, like the Good Samaritan? Who have faith like the Roman centurion? Who are enthusiastic like John the Baptist? Who dare the new, like Paul? Who are faithful like Mary Magdalene? I advise the Pope and the bishops to seek out twelve people outside the lines for administrative positions, people who are close to the poorest, who are surrounded by young people, and who try new things. We need to be with people who burn in such a way that the Spirit can spread itself everywhere.' While the official Church does many things well, I think one of its biggest mistakes is not seeking advice from the wider Church. This appears to be what Bishop Bill Morris was doing to help solve the problem of a shortage of priests. Instead of 'sacking' Bill Morris, the Official Church should be copying his example. We urgently need a Vatican III with heavy lay involvement! Benedict has abused the trust invested in him to lead his church. Injustice is done. The official Church sanctions it yet again. The laity are silenced. We are all told to behave ourselves and get on with it as if nothing has happened. Blind, deaf and dumb like those monkeys. Seems a long way from Jesus who said he came that we may have life and have it to the full.Will a time ever come when these powerbrokers will begin to follow Jesus?